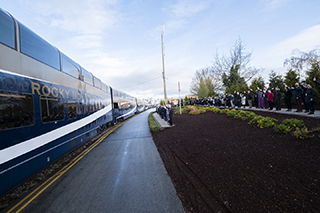 Rocky Mountaineer will be adding seven new GoldLeaf Service rail cars on its Western Canadian rail routes. Four of the luxury rail cars will be added in APR, and the final three will join the fleet in 2020, bringing the company’s total to 26 GoldLeaf rail cars and 16 single-level SilverLeaf cars. The new two-level rail cars, which can each sit 72 guests, will be added to the trains travelling on two of Rocky Mountaineer's routes: First Passage to the West, a two-day rail journey between Vancouver and Lake Louise or Banff, and Journey through the Clouds, a two-day rail journey between Vancouver and Jasper. These new rail cars, engineered and built by Swiss rail car company Stadler at its facilities in Germany, mark the largest capital investment in Rocky Mountaineer's history and serve to mark the rail company’s 30th anniversary.